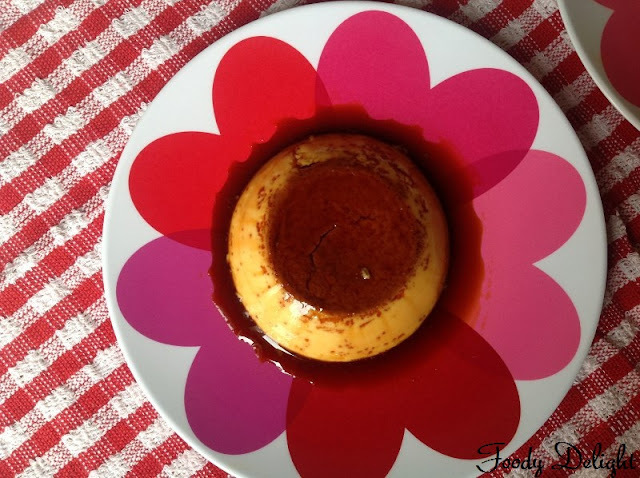 Caramel Pudding is the easy-to-make pudding , very popular all over India but made especially well by the Parsis, Mangaloreans (both from Western India) and the Anglo-Indians. It can be steamed in a pressure cooker or baked in the oven. Combine the sugar and water into a pot and place it on medium flame.Stir the mixture continuously till the sugar completely caramelizes and changes its colour to dark golden in colour. You can see big bubbles,when sugar starts to caramelize, to avoid those bubbles you can add few drops of water. Grease the small bowl with the unsalted butter and then pour about 1 tsp of caramalized sugar into each bowl.Keep it aside. Whisk all the eggs in one bowl.Keep it aside. Combine milk and sugar in another pot and place on the low flame only to dissolves sugar completely in milk. Then mix in the milk mixture into egg mixture.Add vanilla essence and mix everything well. Strain the mixture to avoid any egg white strands. Pour the mixture into greased bowl with the caramelized sugar at the bottom of the bowl. Seal all the bowls with the aluminium foil. Steam the pudding bowls on low -medium flame for about 20 minutes. I steamed them in the simple non stick pan with the water in it.You can also steam them in the pressure cooker without the whistle. When done, unseal the bowls and allow the pudding to cool down. Refrigerate the pudding bowls for about 4 to 5 hours. When the pudding is set, take it out of the refrigerator, using the knife loosen the edges of the pudding and turn over on to the plate. Caramel pudding is ready to serve. 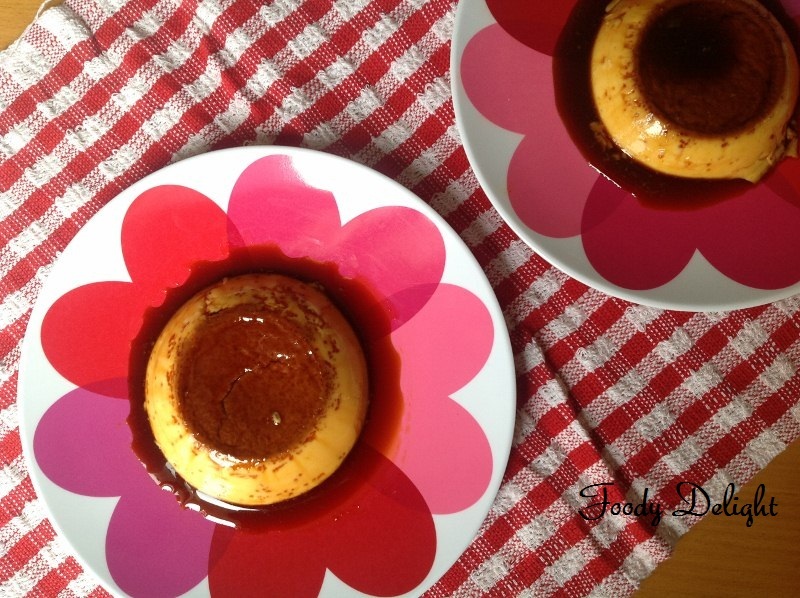 When caramelized sugar is cooked, at that instant pour the caramelized mixture into the bowls or ramekins. Because there are chances of the caramelized sugar to get harden. Unsalted butter prevents the sticking of the pudding to the bowls. Do not the steam the pudding on high flame, this may leave the pudding uncooked. 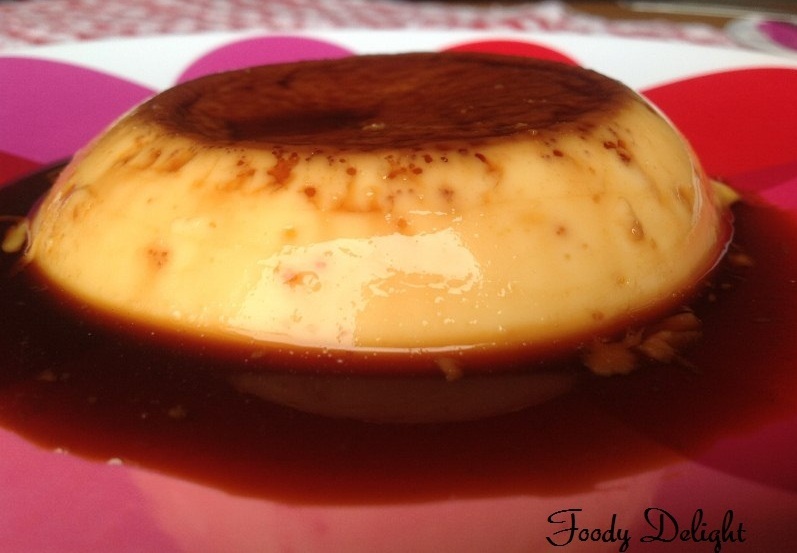 Caramel pudding (aka flan/creme caramel) is one of my favorite desserts. 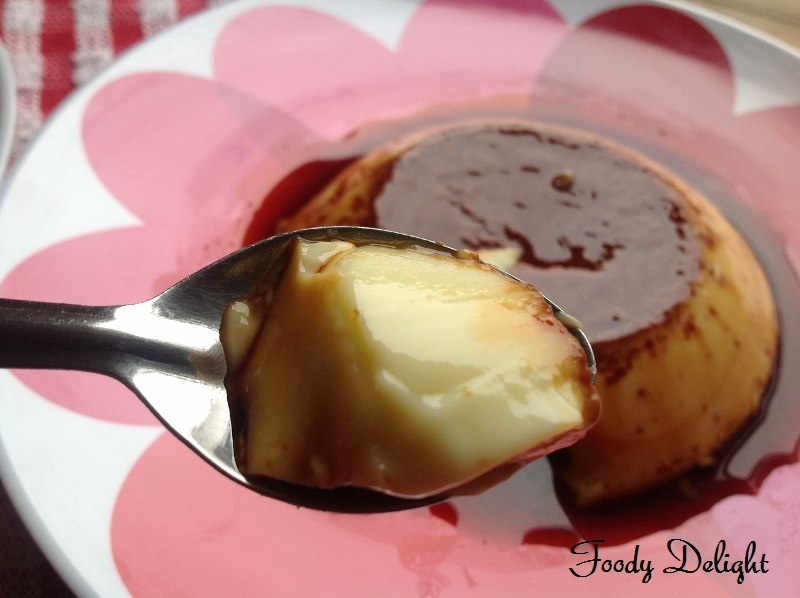 Infact, it was first recipe I posted on my blog (http://sadaf-culinaryadventures.blogspot.ca/2011/06/creme-caramel.html). My all time favourite dessert! very nice.. loved the clicks! This dessert looks delightful! I love your presentation...the flower plates are great! 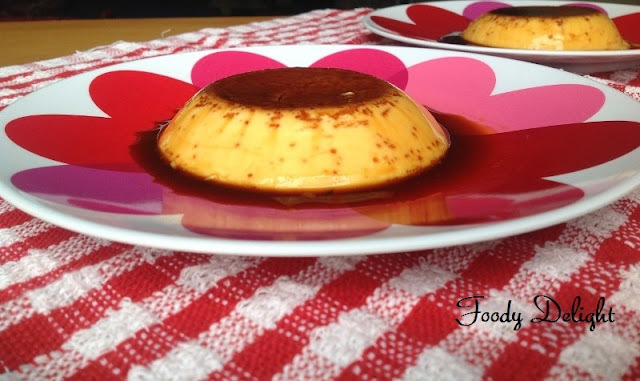 We love flan, this recipe is quick and easy. Thanks for posting :o) Very nice blog...lot's of great recipes! big WOW... my all time favourite dessert... good job my dear.. I a folowing you on google+, bloglovin, and GFC. Thanks so muchf or stopping by the blog hop! Are you on pinterest? What an exquisite dessert!!! I love caramel...and this is so, so lovely!! Beautiful! Thank you for dropping by my place and for the friendship. Happy to follow you too! It looks amazing in those lovely plates!